Below are the standard rental terms. If you have any questions please do not hesitate to contact us and we will help you through the rental process. Rental payments are due at the time of service; are pre-paid and non-refundable. Rentals are charged by auto-pay. We’ll need an active credit card to start. Although we do NOT send you a rental invoice, you will receive an email confirming your auto-pay charge. It is your responsibility to make sure we have your current card information. If we are unable to process your charge within a week of its due date we will assess a $15 late charge. 100% of the “Rental Fee” can be applied towards the purchase of an instrument or used to upgrade your instrument, as long as your account is in good standing..
Once your rental term has expired you may choose to continue our “worry free” rental program (includes strings, re-hairs at wholesale costs and most repairs for free.) At the end of your term, should you choose to continue, your deposit will be returned. You will also continue to accrue credit as long as your account remains in good standing. Credits accrued can only be applied to an instrument of equivalent or higher value to the rental instrument. Credits are not transferable from one person to another. 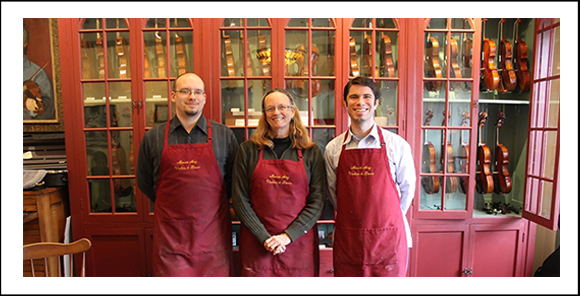 Our regular rental protection fee does NOT cover lethal damage, bow rehairs, cleaning and polishing, removal of anything attached to the instrument or new strings. Our protection fee, however, covers most damage and allows you to pay wholesale rate on new strings and rehairs..
You may be charged a $35 re-stocking fee if your instrument is in need of maintenance when traded in for a larger size. If we are unable to collect your rental fee after repeated attempts you will lose all accrued credit and we will demand the return of the instrument and all due past charges.